In a large bowl combine chicken pieces, artichoke hearts, Parmesan, 4 ounces of the Mozzarella cheese and half of the tomatoes. In another bowl beat together the cream cheese, heavy cream, garlic, salt and pepper until well blended. Divide cream cheese mixture in half and add one half to the chicken mixture. Using a 9×13 baking dish spread some of the non-chicken cream cheese mixture into the bottom. 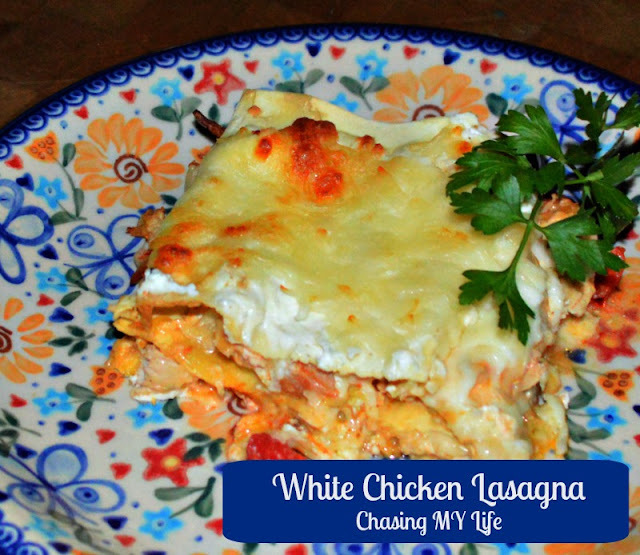 Top with an even layer of lasagna noodles. Top with one third of the chicken mixture. Top with one third of remaining tomato pieces. Spread remaining cream cheese mixture on last layer of noodles. Top with remaining non-chicken Mozzarella cheese. Bake another 10 minutes until noodles are cooked through. OPTIONAL: If you prefer a more traditional flavoring, add 1-2 tablespoons of tomato paste to the cream cheese mixture. Thank you! I actually like it leftover almost better – so much flavor has soaked in!